As we all know, battery life is still one of the biggest downsides of technology, particularly wearables. But researchers at North Carolina State University have found a way of using body heat to generate electricity in a small, easy-to-wear device. The generator conforms to the shape of the body and produces considerably more electricity than previous tech like this. 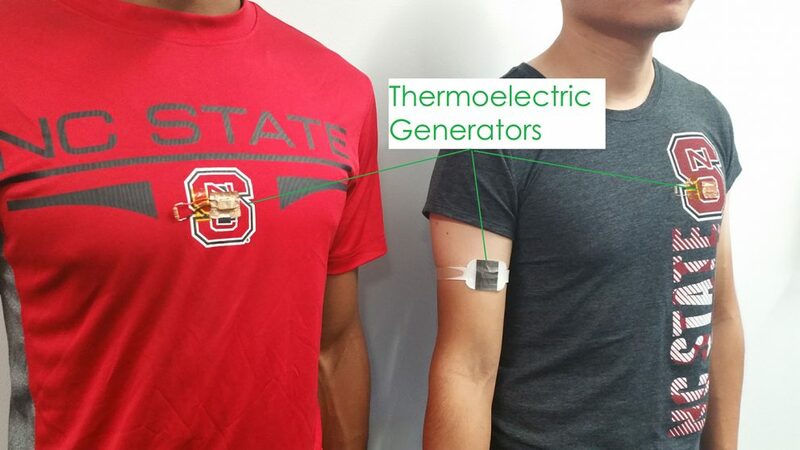 "Wearable thermoelectric generators (TEGs) generate electricity by making use of the temperature differential between your body and the ambient air," said NC State associate professor Daryoosh Vashaee. While the prototype is only one centimetre squared, Vashaee said that it could easily be made larger. But the point is that this latest prototype is far more efficient than what's come before. "Previous approaches either made use of heat sinks – which are heavy, stiff and bulky – or were able to generate only one microwatt or less of power per centimeter squared (µW/cm2)," said Vashaee. "Our technology generates up to 20 µW/cm2 and doesn't use a heat sink, making it lighter and much more comfortable." The researchers also managed to fit the device into a t-shirt and have it still generate a decent amount of power. ASSIST, the body at NC State that worked on the project, wants to make wearable tech that can be used for long-term health monitoring without relying on batteries - and this is a big step forward.